Many people think of sap as a tree’s blood and the comparison is accurate to a point. Sap is the sugar produced in a tree’s leaves by the process of photosynthesis, mixed with water brought up through the tree’s roots. 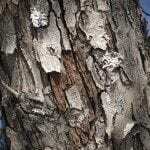 The sugars in sap provide fuel for the tree to grow and thrive. When the pressure changes inside a tree, usually due to changing temperatures, the sap is forced into the vascular transporting tissues. Any time those tissues are punctured in a maple tree, you may see a maple tree oozing sap. Read on to find out what it means when your maple tree is dripping sap. Why is My Maple Tree Leaking Sap? Unless you are a maple sugar farmer, it is disconcerting to see your maple tree oozing sap. 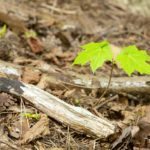 The cause of sap leaking from maple trees can be as benign as birds eating the sweet sap to potentially fatal diseases of the maple. Those who harvest sap for maple sugar production reply on sap leaking from maple trees for their income. Essentially, maple sugar producers pierce the vascular transporting tissues of a maple tree by drilling a tap hole into those tissues. When the maple tree is dripping sap, it is caught in buckets hung on the tree, then later boiled down for sugar and syrup. 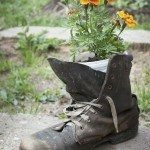 Each tap hole can yield from 2 to 20 gallons of sap. Although sugar maples yield the sweetest sap, other types of maples are tapped as well, including black, Norway, red and silver maple. Not every maple tree oozing sap has been drilled for syrup. Animals – Sometimes birds peck holes in the tree trunks in order to access the sweet sap. If you see a line of holes drilled in a maple trunk about 3 feet from the ground, you can assume that birds are looking for a meal. Other animals also deliberately take action to get the maple tree sap dripping. Squirrels, for example, might break off branch tips. Pruning – Pruning maple trees in late winter/early spring is another cause of sap leaking from maple trees. As temperature rises, the sap begins to move and oozes out of the breaks in vascular tissue. Experts say that this is not dangerous for the tree. Disease – On the other hand, sometimes it is a bad sign if your maple tree is dripping sap. 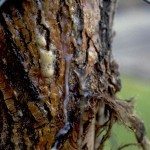 If the sap comes from a long split in the trunk and kills the tree trunk wherever it touches the bark, your tree may have a potentially lethal disease called bacterial wetwood or slime flux. All you can do is to insert a copper tube in the trunk to allow the sap to get to the ground without touching the bark. And if your tree is a silver maple, the prognosis could be just as bed. If the tree has cankers oozing sap and the sap leaking from the maple trees is dark brown or black, your tree may have bleeding canker disease. If you catch the disease early, you can save the tree by removing cankers and treating the trunk surface with an appropriate disinfectant.